One(1) newly painted head sculpt with vivid and detailed likeness of the laughing bat. -One(1) iron chain. -Two(2) pairs of hands. You will get -One(1) leather coat. Greg Capullo (Desing). About This Statue. Type: Statue. Manufacturer: DC Collectibles. Product Size Size and weight are approximate values. Height: 11.25" (285.75 mm) |. From Herocross. Adam West played Batman in the 1966 show where he faced four main recurring villains in the show, The Joker, The Penguin, The Riddler and Catwoman. DC COMICS BATMAN HMF-004 AF. HERO CROSS CO. LTD.
BATMAN 1966 Classic tv series BATARANG BOTTLE OPENER DIAMOND SELECT NEW! A Diamond Select Toys Release! An essential item for any utility belt! With two magnets on the back, it will hang on your Bat-fridge until it's needed! BATMAN 1966 BATARANG BOTTLE OPENER. DIAMOND SELECT TOYS LLC. Peppa Pig & Friends. Massager Relax. Toys & Hobbies. Austraila, New Zealand, Papua, New Guinea, Guam, Saipan. Afganistan, Nepal, Pakistan, Sri Lanka. Real Steel. Bahrain, Iran, Iraq, Jordan, Turkey, Kuwait, Saudi Arabia, Qatar, Syria. Rare Collectible released in 1999! Has Minor Shelf Wear. By ordering, you agree to these conditions. Batman Batmobile car toy 1:43 (ERTL 1989). It's TheDC Bottle Opener - Batman 1966 Classic TV Series Batarang. An essential item for any utility belt! With two magnets on the back, it will hang on your Bat-fridge until it's needed! This is a Batman 1966 TV Batman Hybrid Metal Figure made by the good folks over at Herocross. This metal figure is approximately 5.25 inches tall and comes with multiple accessories, including Batarang, interchangeable hands, and display stand. This figure is a finely detailed, high quality collectible that any fan of Batman would love. 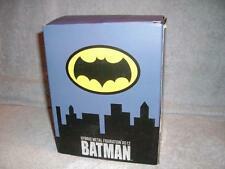 Recommended Age: 15 Condition: Brand New Dimensions: 5.25" X 1 Herocross Batman 1966 TV Batman Hybrid Metal Figure. Mint condition. Just your normal on the shelf wear. Exclusive Jada Toys . DC COMIC GALLERY DARK KNIGHTS METAL RED DEATH STATUE (PRE-ORDER)! With bat-shaped speed lightning whipping around him as he screeches to a halt, this Speed Force-empowered Batman is the perfect addition to any Batman or Flash collection! EXPECTED RELEASE DATE FOR THIS ITEM IS APRIL 2019 (RELEASE DATE SUBJECT TO CHANGE). Classic TV Series 1966. The plastic mold is sealed with original tape. Good communication is a must! See "Condition Details.". It really quits being fun when people do not follow the rules. It will get there. Hot Toys Batman & Flash Cosbaby. 100% New Official Authentic Hot Toys Cosbaby. Diecast action body with over 20 points of articulation. Head, hands, and boots in ABS plastic; pants in PVC plastic. Fabric cape x 1 and ABS plastic cape x 1. Batarang and 5 interchangeable hands. Magnet feet lock at dragon gargoyle base. (approximate). Sculpted PVC face. Detailed skin-textured face. Ball-jointed shoulders for full range of. Two ABS batarangs. Ball-jointed ankles with articulated boot front. We will try our best to sort it out. We believe that everything could be solved by kindly communication. We will reply you as soon as possible. 1989 Batman Metal Poster 18 1/4" X 13 1/4"
It has on small ding on the left center side and a few minor scratch marks. Riddler Pin. We are top rated for a reason! Item is in good loose displayed shape. Takara Tomy. Model number Size(about) We could NOT take any liabilities nor responsibilities for injury, sickness, and all the other inconveniences caused through usage of products. All product manuals are in Japanese. I originally bought it because I liked how cool Batman looked and the flightpak is pretty nice too. Batman Classic TV Series 1000 Piece Puzzle with 2 Batmobile Metal Puzzles, NEW! This is a Brand New Batman Classic TV Series 1000 Piece Puzzle with 2 Batmobile Metal Puzzles, all in need of a New Home! Please check out the photos for more details and as always Thank You so much for looking and please take the time to look at the other items I have posted for sale, I have something for everyone!!!! The Batarang has been one of Batman’s most trusted tools since it first appeared in Detective Comics #31. The Batarang has appeared in all adaptations of The Dark Knight. It is Batman’s main tool for ranged attacks since he rarely uses any form of gun. Made by HeroCross. What you see is exactly what you will get. BATMAN ANIMATED SERIES BATMOBILE BOTTLE OPENER DIAMOND SELECT NEW! A Diamond Select Toys Release! DIAMOND SELECT TOYS LLC. We are top rated for a reason! We can make your collection GREAT! Which of course is FRAUD and theft. Are you a collector?. We are grateful for your interest in Batcave Treasures! 5 out of 5 stars - BATMAN ANIMATED SERIES BATMOBILE BOTTLE OPENER DIAMOND SELECT NEW! 2 product ratings2 product ratings - BATMAN ANIMATED SERIES BATMOBILE BOTTLE OPENER DIAMOND SELECT NEW! SEE PHOTOS FOR ITEM CONDITION AND DETAILS. This is a Batman SDCC Color Variant Hybrid Metal Figure made by the good folks over at Herocross. The metal figure is approximately 5 inches tall and comes with multiple accessories, including Bat Signal, interchangeable hands, and display stand. The figure is a finely detailed, high quality collectible that any fan of Batman would love. 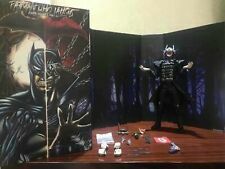 Recommended Age: 15 Condition: Brand New Dimensions: 5" X Herocross Batman SDCC Color Variant Hybrid Metal Figure.